Panama’s Centennial Bridge (Spanish: Puente Centenario) is a major bridge crossing the Panama Canal. It was built to supplement the overcrowded Bridge of the Americas, and to replace it as the carrier of the Pan-American Highway; upon its opening in 2004, it became only the second permanent crossing of the canal. The Centennial Bridge is located 15 km (9.3 mi) north of the Bridge of the Americas, and crosses the Gaillard Cut close to the Pedro Miguel locks. 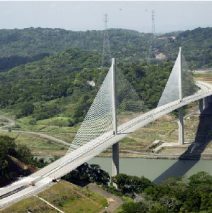 New freeway sections, connecting Arraijan in the west to Cerro Patacon in the east via the bridge, significantly alleviate congestion on the Bridge of the Americas.